1. The number of new applications for all three types of patents in Q3 2015 came down by 6.0% to 18,059 cases. 2. Applications for invention (10,946), utility model (5,135) and design (1,978) patents decreased by 4.4%, 11.0%, and 1.4%, respectively (Table 1). 3. The number of domestic applications (4,090) for invention patents dropped by 11.4%, whereas foreign invention applications (6,856) grew by 0.4%. 4. Breakdown by country, Japan (3,106) topped the list, followed by the US (1,768), South Korea (446), mainland China (354), and Germany (339) (Fig.3). 5. 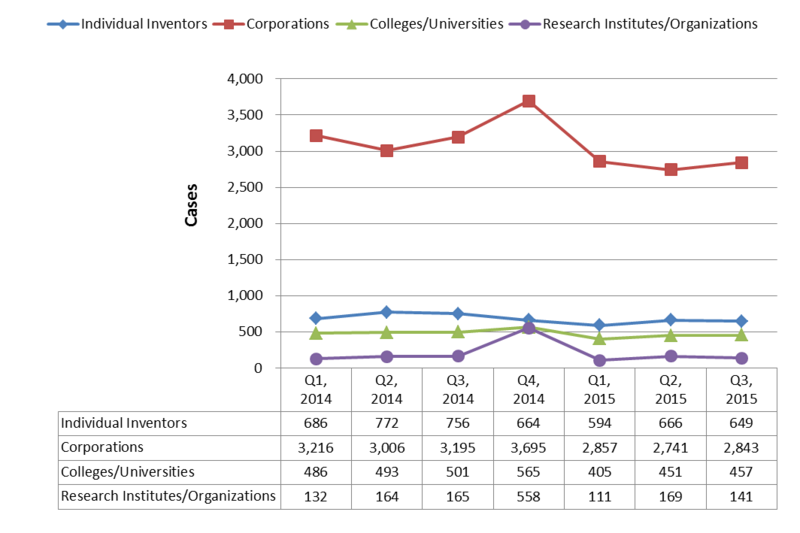 Applications for invention patents filed by domestic corporations (2,843), universities (457), research institutes (141) and individual applicants (649) were down by 11.0%, 8.8%, 14.5%, and 14.2%, respectively (Fig.1). 6. The top five domestic corporations applying for invention patents were Hon Hai (82), Taiwan Semiconductor Manufacturing Company (TSMC) (80), AU Optronics (71), Acer (52), and Industrial Technology Research Institute (ITRI) (51) (Fig.2). 7. As for foreign corporations, Intel (236) topped the list, followed by Fujifilm (133), Toshiba (126), Samsung Electronics (98), and Tokyo Electron (92) (Fig.2). 1. Compared to the same period in 2014, from Q1 to Q3, the number of patent grants for all three types of patents increased by 2.3% at 57,621 (Table 3). 2. 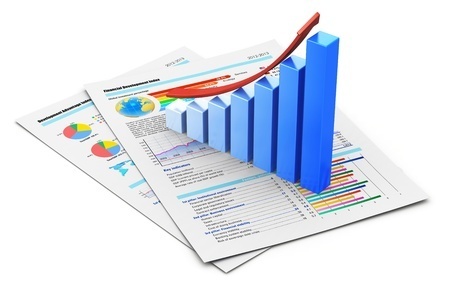 Patent grants for invention (35,083) and design (5,634) increased by 5.7% and 10.5%, respectively. However, patent grants for utility model (16,904) decreased by 6.3% (Table 3). 3. The number of invention patents granted to domestic applicants (15,571) was down by 0.2%, whereas those granted to foreign applicants (19,512) went up by 10.9% (Table 3). 4. Breakdown by country, Japan (8,546) came out on top, followed by the US (5,562), South Korea (1,285), mainland China (868), and Germany (855) (Fig.4). 5. In the number of granted invention patents, the top five domestic corporations were Hon Hai (1,085), ITRI (680), AU Optronics (503), Wistron (356) and TSMC (262) (Fig.5). 6. In addition, the top five foreign corporations were Intel (389), Semiconductor Energy Laboratory (306), Apple (305), Tokyo Electron (270) and Qualcomm (253) (Fig.5). 1. 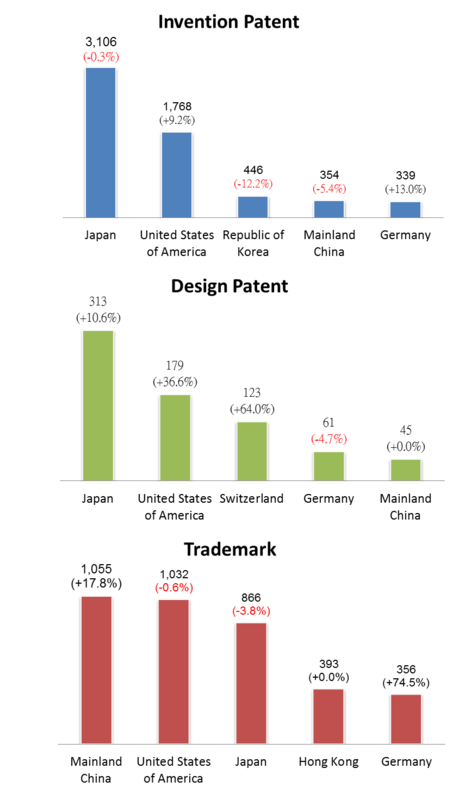 The number of new applications for trademark in Q3 2015 grew by 3.7% to 20,302 cases (Table 1-1). 2. 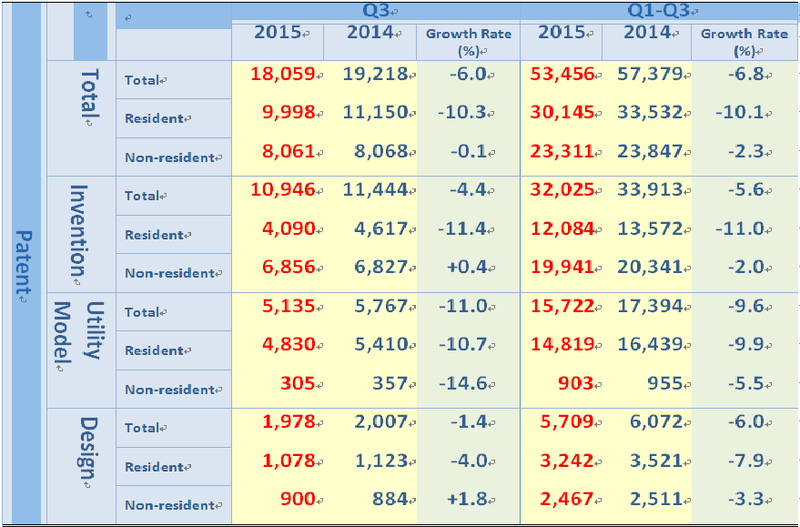 The number of domestic and foreign applications totaled at 14,725 (+2.7%) and 5,577 (+6.5%) cases, respectively (Table 1-1). 3. 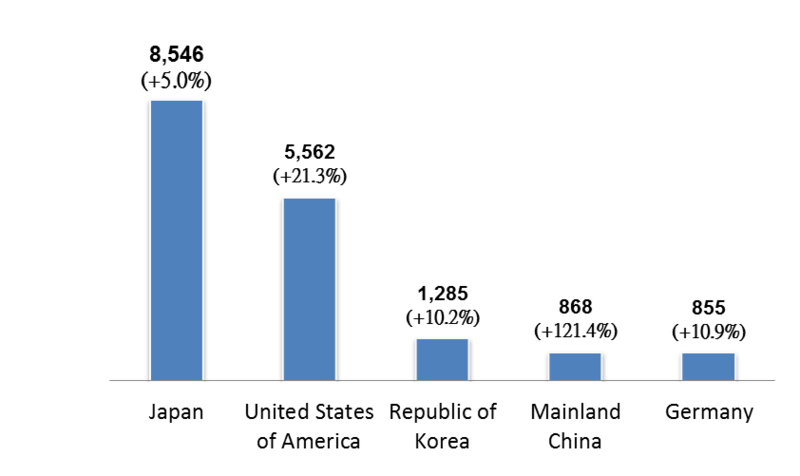 Breakdown by country, mainland China (1,055) came out with the most applications, followed by the US (1,032), Japan (866), Hong Kong (393), and Germany (356) (Fig.3). © World Patent Limited Company Inc All Rights Reserved.